Cosmic dust refers to particles that originate from the interplanetary medium and that have a diameter of ~100 µm or smaller (Brownlee 1985). This material, also known as interplanetary dust particles (IDPs), can be collected directly from Earth’s atmosphere, Larger grains of between 100 µm and 1 mm in diameter are generally called micrometeorites, but these are not of concern in this article because they settle to Earth too quickly to be efficiently collected from the atmosphere. Approximately 100,000 kg of dust grains, including samples from asteroids and comets, fall from space into the Earth’s atmosphere each day. But whereas meteorites are a very biased sample of asteroids, all dust-shedding Solar System bodies can contribute to the cosmic dust samples that ultimately fall to Earth, because Earth sweeps up dust very effectively as it orbits the Sun. As this dust settles through the atmosphere, it mixes with other types of dust and debris, such as spacecraft debris, volcanic ash, windborne desert dust, and pollen grains. All these materials eventually reach the Earth’s surface, but the very small particles settle on a timescale of months; therefore, they can be collected in situ. And the least contaminated IDP samples are found at the highest altitudes. Figure 1 - Two round, large-area cosmic dust collectors deployed beneath the wing of a NASA ER-2 aircraft in flight. NASA has collected particles in the stratosphere for nearly three decades, building on the groundbreaking work of Don Brownlee (Brownlee 1985). High-flying, and piloted, ER-2 and WB57 stratospheric aircraft with special sticky collectors capture this dust at altitudes of approximately 20 km. The particles are collected on Lexan plates coated with silicone oil, which are deployed below the aircraft’s wings (Fig. 1). “Conventional” collectors are about the size of the palm of your hand; much larger “Large Area” collectors are each about 10 inches in diameter. The collectors are shielded during periods of takeoff, low altitude flight, and landing to minimize contamination by terrestrial dust. Most collectors are carried as secondary payloads on NASA aircraft that are flying a variety of missions. These collectors are generally exposed over many flights, which results in a total collection time of tens to one hundred hours of flight time over a range of locations. The majority of stratospheric collections are made at random times. However, ever since Al Jackson and Herb Zook proposed that there should be enhancements in certain types of asteroidal and cometary dust at certain times of the year (Al Jackson and Herb Zook, personal communication, 1992)—an idea further developed by Dermott and Liou (1994)—we at NASA’s Johnson Space Center (JSC) have flown collectors (“timed collections”) for specific and limited times every year. Since the inception of the timed collections in 1994, we have ensured that specific collection surfaces have sampled stratospheric dust for each individual month of the year, as well as for particularly interesting shorter time periods (Warren and Zolensky 1994; Zolensky and Wilson 1994). Recently, we made a special effort to fly collectors at times of enhanced dust infall (meteor showers) from the comets 55P/Temple–Tuttle and 26P/Grigg–Skjellerup, at the urging of Scott Messenger (NASA JSC) and Peter Jenniskens (SETI Institute) (Messenger 2002). We consider these efforts to be long shots because the enhancements of the comet dust from these particular shower events over background extraterrestrial material is significant but not large. Nevertheless, we have made a special effort to provide these collection surfaces to the community because of the fantastic potential payoff from successfully gathering comet dust from a known source at such a low cost. Although these timed collectors cannot be connected with any particular body with certainty, unusual particle mineralogies, very short space exposure times, and other unique features have been used to claim a cometary origin for some of these specially captured grains (Messenger 2002). 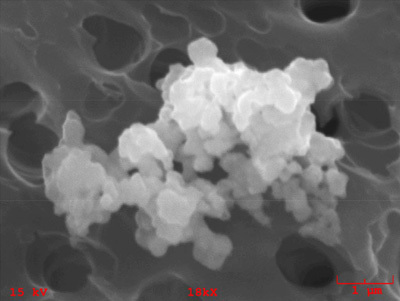 Figure 2 - A potential coma dust grain from comet 21P/Giacobini–Zinner, which was captured in the stratosphere following the great Draconid meteor storm of 2012. The poor image resolution results from not carbon-coating the samples for SEM observation, to minimize contamination. The substrate is a Nucleopore membrane. For the annual meteor showers, we can plan flights well ahead of time. We have occasionally attempted sample collections at very short notice. On 8 October 2012, real-time radar measurements obtained by the Canadian Meteor Orbit Radar during the 2012 Draconid meteor shower indicated a short but intense 2-hour meteor storm (Peter Brown, personal communication, 2012). The Draconids originate from comet 21P/Giacobini–Zinner and have one of the slowest atmospheric entry velocities (23 km/s). They, thus, offer significant possibilities for successful dust capture in the stratosphere. 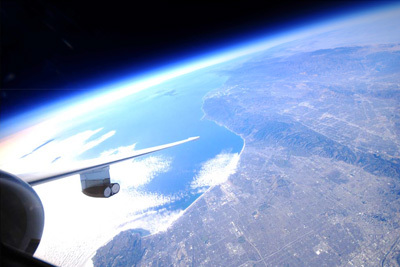 The 2012 event was a fortunate occasion because NASA had stratospheric aircraft that were immediately available for missions. Although the collected material has yet to be fully (and very carefully) analysed, we may now have samples of coma dust from another comet in our collection (Fig. 2). Following each flight, the cosmic dust collectors are removed from the aircraft and transferred to the Cosmic Dust Laboratory at the Johnson Space Center in balmy Houston, Texas (USA). The Cosmic Dust Laboratory was established in 1981 to locate, prepare, characterize, preserve, and distribute particles collected in the stratosphere. The laboratory is nominally a Class 100 (ISO 5) laminar flow clean room, although in practice it is far cleaner at the end where particles are handled (Fig. 3). Having such a great lab would be of little value if we did not have very talented, manually adept, and calm scientists to harvest the microscopic samples and make preliminary analyses. Fortunately, we have Ron Bastien, Kathleen McBride, Melissa Rodriguez, and Carla Gonzales, all of whom are dedicated to this program. Collection surfaces are examined using an optical microscope, and particles are removed from the silicone oil and rinsed in filtered hexane. Each year, a representative fraction of the collected particles are harvested from collectors and then imaged by scanning electron microscope (SEM), their bulk elemental abundances being determined by energy dispersive X-ray analysis (EDX). These initial data are reported in the online Cosmic Dust Catalogs (http://curator.jsc.nasa.gov/dust/catalog.cfm). NASA’s Cosmic Dust Collection. What’s in it? Harvested individual dust particles are stored in high purity, dry nitrogen gas at positive pressure. Currently, the NASA collection includes over 3,000 such precharacterized particles; however, most collected grains remain on their collection surfaces, in whole or in part, to minimize terrestrial contamination. In fact, fewer than 50% of the collection surfaces have had any particles removed. Even the “picked” collection surfaces generally have many remaining particles. All of these curated materials—from untouched collection surfaces to harvested and cataloged particles—are available to any suitably qualified investigator. 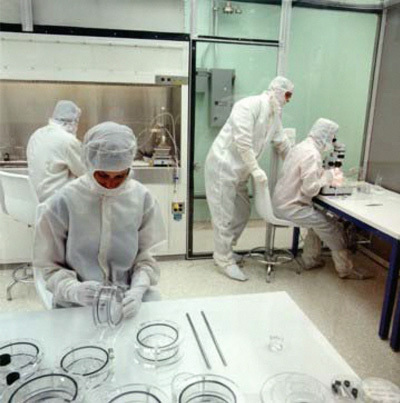 Figure 3 - View of the cleanest section of the Cosmic Dust Laboratory at the NASA Johnson Space Center (Texas, USA), where dirty humans are isolated from the harvested dust by bunny suits. Small cosmic dust collection surfaces are shown in the foreground, housed within Lexan “coffins”. NASA’s Cosmic Dust Collection includes cometary particles, particles derived from asteroids (Brownlee 1985; Zolensky et al. 1994; Rietmeijer 1998), and possibly even particles from the Moon (Zolensky et al. 1998). Although the particles have all been heated by interaction with Earth’s atmosphere, many of them preserve remarkably delicate textures and volatile-rich compositions. Cosmic dust grains include our least-altered samples from comets, probably containing material in the same condition as when the Solar System began to form. Microanalysis has also identified subparticles within larger complex cosmic dust particles with compositions consistent with an interstellar molecular cloud origin (Messenger 2000), i.e. they are either high-temperature condensates that formed during the very earliest formation of our Solar System (McKeegan 1987; Zolensky 1987), or they are from the outflow of another star, or they originated from supernova explosions (Nakamura-Messenger 2010). Any one of these possibilities is tremendously exciting. The NASA Stardust mission, which returned the first robotically collected samples of a Jupiter-family comet (81P/Wild-2) in 2010 (Brownlee et al. 2006), was, to a large degree, made feasible by the generation of planetary scientists who have been trained in how to analyze cosmic dust particles. And now that we have 100% verified cometary coma dust, we have been reexamining our previous cosmic dust collection from Earth’s stratosphere with new eyes: it turns out that our carefully conceived ideas of what to expect from comet dust were often dramatically wrong. Unlike the other materials curated by NASA, the Cosmic Dust Collection is also used by scientists studying the Earth’s atmosphere and biosphere. We maintain what is probably the world’s best sampling of stratospheric dust through the past 35 years. It must be borne in mind that 90% of the collected particulates and aerosol droplets are not of extraterrestrial origin. The Cosmic Dust Collection contains abundant samples of spacecraft debris particles caught in the act of returning to Earth (Zolensky et al. 1989), Saharan sand grains, and volcanic ash from every stratosphere-venting volcanic eruption since 1981. Microbiologists have also been accessing the Cosmic Dust Collection to investigate the airborne migration of microorganisms across our planet (Griffin 2004). These are bonus benefits from NASA’s Cosmic Dust Program.